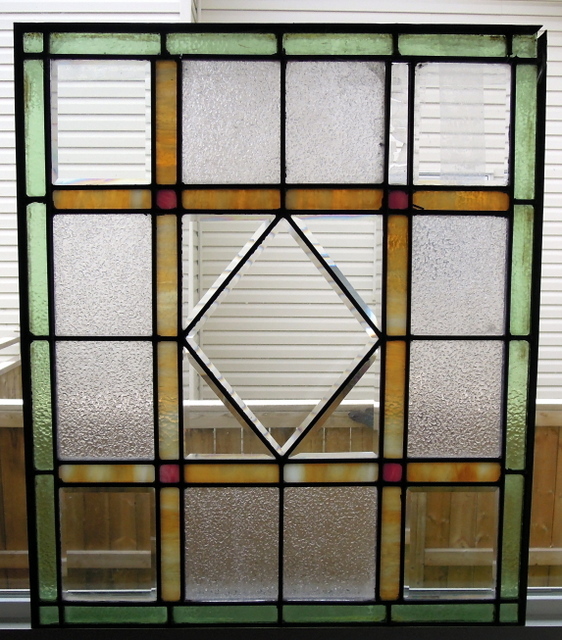 This old came stained glass door panel had reached the point where if it was not removed from the door it was in great jeopardy of collapsing and being ruined forever. As you can see in the picture below, the frame was coming apart. While not visible when you pushed slightly on the center, the whole panel moved in and out a lot and would completely fall apart if the door was slammed or someone pushed on the panel to open the door. Only 1 piece of glass was missing (the amber piece on the top right) while the rest was all in its original state. 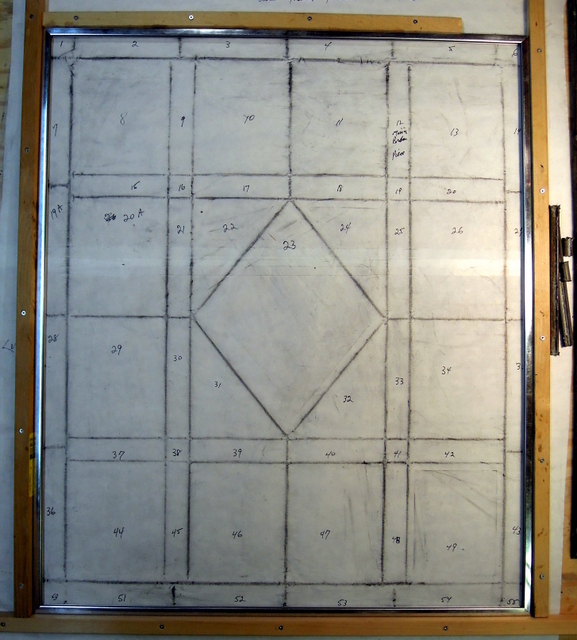 When restoring these old came panels we securely fasten a sheet of white freezer paper over the whole panel, then using carbon paper we do a rub to have a pattern for restoration. 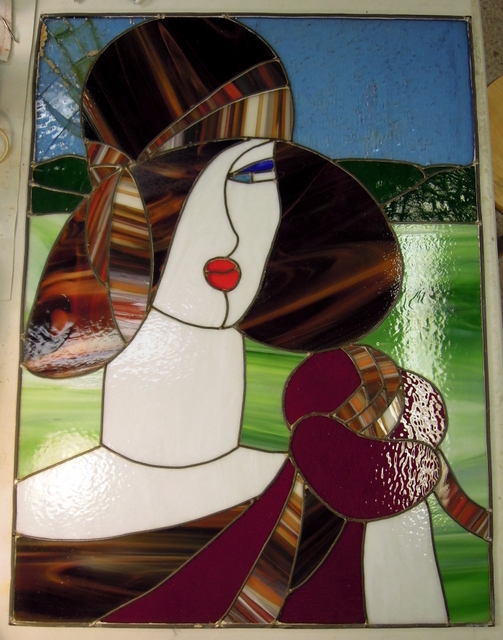 The panel measured 22 inches wide by 26 1/16 inches high including it’s 3/8 inch zinc frame. The process involves carefully removing the panel and transporting it to our studio. 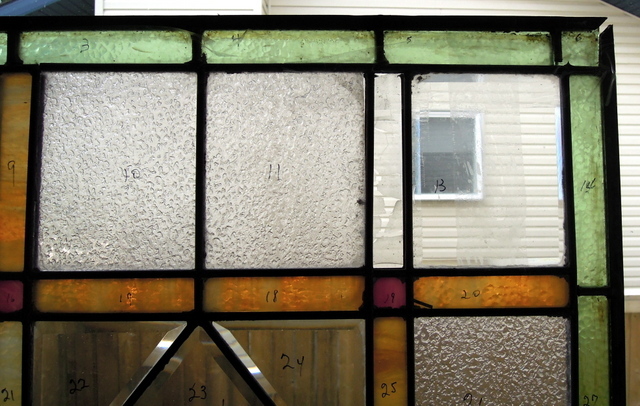 In the restoration process we take multiple photographs and number each glass piece. The challenge in this restoration was the very wide came originally used and not replaceable. 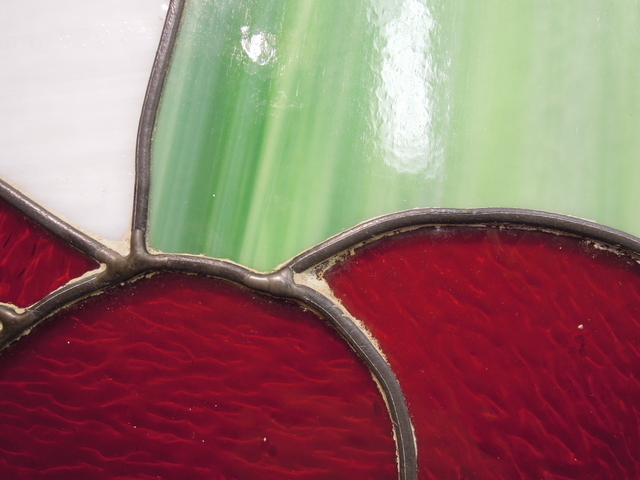 The reason for the wide came was for the bevels which were made from very thick glass. This presented a problem for restoration as we needed to use H Round Zinc Came 1/4 inch face to ensure a strong interior strength coupled with 3/8 Zinc Border Came. We solved this problem by using a standard grit Aanraku Ripple Bit. This allowed us to grind down each side of these very thick bevels so they could be inserted into the new round zinc came. However it was imperative that we grind each side equally so we practised on a bevel that we had in stock. Then through trial and error we set up the ripple bit to ensure removal of the same amount of glass from each side of the bevel before inserting them into the panel. 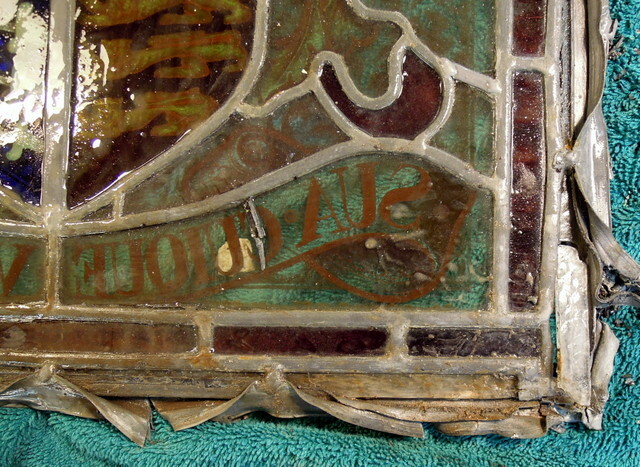 The following photo shows a portion of the panel with all of its pieces numbered, we then carefully took the panel all apart and that is when we found out how very thick the glass was in these old bevels. In the next photo we have now taken the rub pattern and set up a wooden frame, complete with the 3/8 zinc border came, ensuring that we have the measurements exactly so it will fit back into the original wooden door which our client was getting restored. Please note on the right side there are a couple of pieces of the very old came originally used. The last photo is of the completely restored panel. Fortunately we had a piece of old glass that matched the one broken piece in the panel. We cleaned each piece of glass, carefully measuring and cutting the H zinc came. After soldering the joints we use Glass Pro Stained Glass Putty to cement the glass and then cleaned with whiting, after which we applied Clarity Polish. In this particular case we did not patina any of the zinc came as we felt it was not required in this restoration. 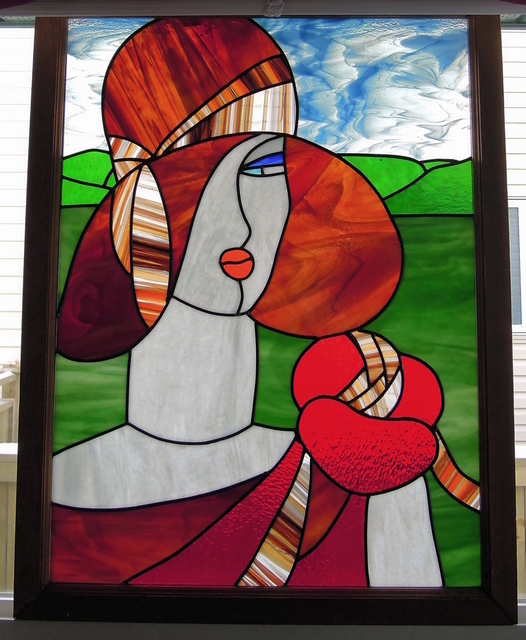 A client from Calgary had this beautiful large lady came panel which had fallen and the sky glass was broken. In addition the soft came edging was coming apart and the whole panel needed to be restored along with new sky glass. 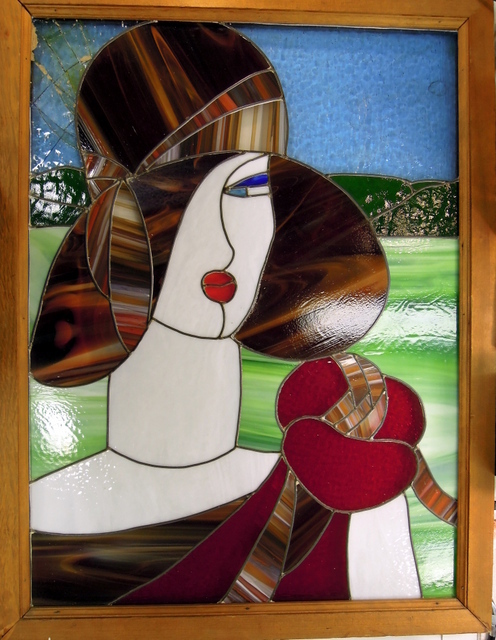 The panel measured approximately 25 inches wide x 33 inches high. 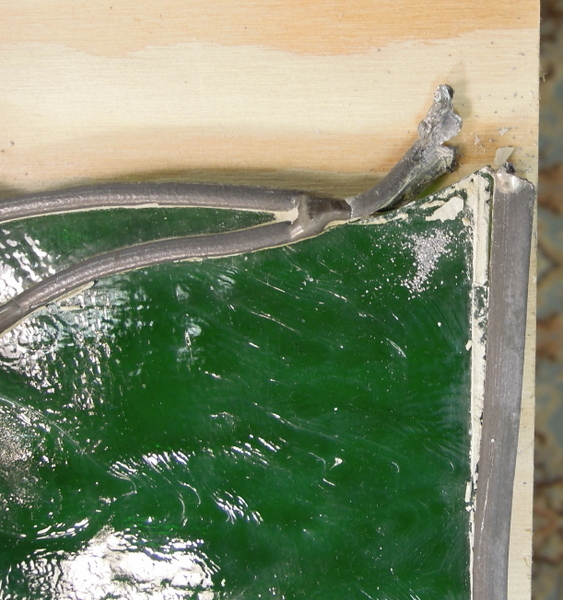 The 2nd photo shows the panel after being taken out of its wooden frame. When the panel fell both sky blue pieces were broken however other than a small crack in one of the darker greens the rest of the glass survived the fall. 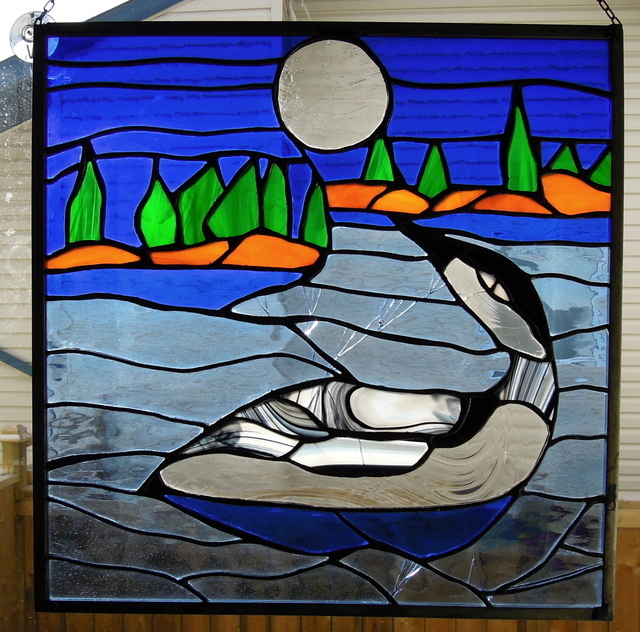 The original artist had used soft lead came for the outer frame and in addition a lot of the came cement had been left on the glass as shown below. When the panel fell it jarred loose many of the old came joints. 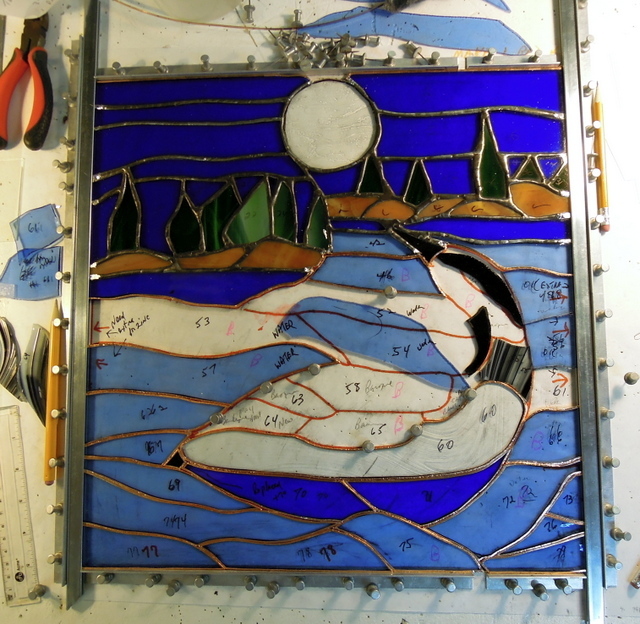 We then numbered each piece of glass, photographed the panel in detail, then took the panel all apart, cleaning each piece as we went along in the restoring, rebuilding process, starting at the bottom of the panel. We had a beautiful piece of Bullseye, Clear, Egyptian Blue Opal #002064-0030 which we used for the sky and it enhanced the overall beauty of the panel. With the cracked piece of the dark green horizon glass we just added in another came joint as we did not want to replace that glass. We decided that as this was such a large panel we upgraded the came used to RH – 12 and also put a 3/8 inch zinc outside came for added strength. After soldering the joints we cleaned off the flux using Kwik Clean and compressed air to ensure all liquid was removed from between the glass and new came. 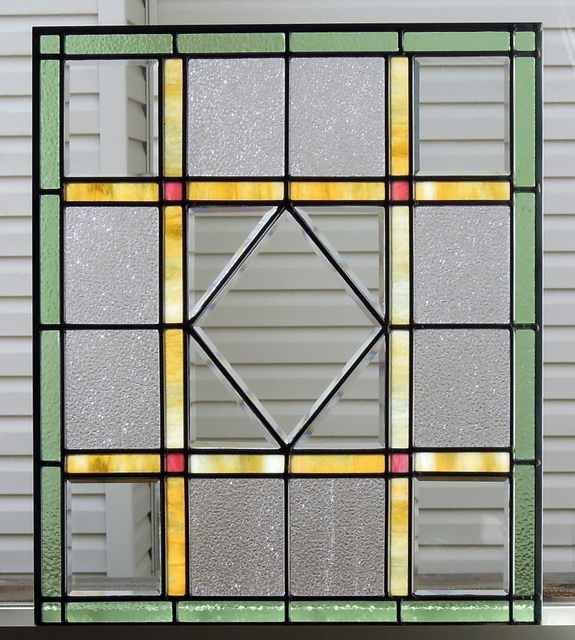 We had an opportunity to obtain a new Stained Glass Putty by Glass Pro, which we found to be excellent to work with. Once the panel was cleaned with whiting, we scrubed all of the lead came with #0000 steel wool and then apply black patina. After which we use Kwik Clean again to clean the panel again before applying a coat of Clarity Stained Glass Finishing Compound. Once the polish is dry we then use several soft cloths along with tooth brushes to ensure a bright clean finish. Here is the finished reconstruction, remounted in the heavy wooden frame. 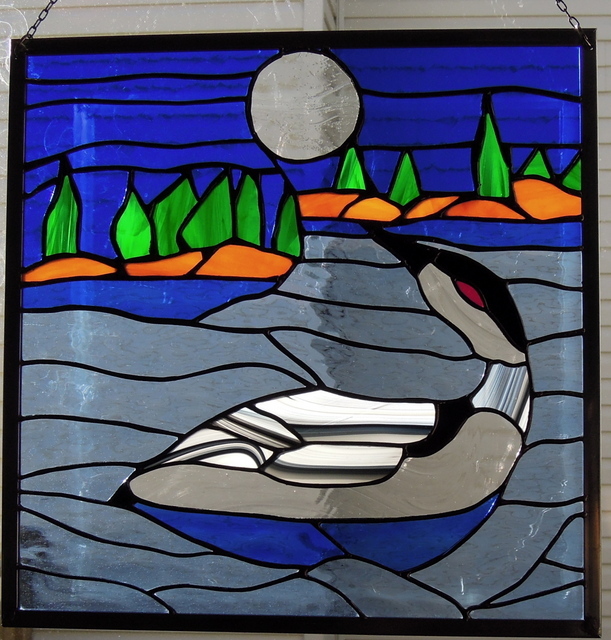 In due course our client in Calgary will be sending us a photo of the panel once she decides where to hang it in her home.